Our flannel boxers are a great choice. The pump pocket is sewn to the inside front waistband and is positioned to the side to stay out of your way. Works with all tubing lengths. Our Flannel Boxers are "unisex" and do not have an open fly. 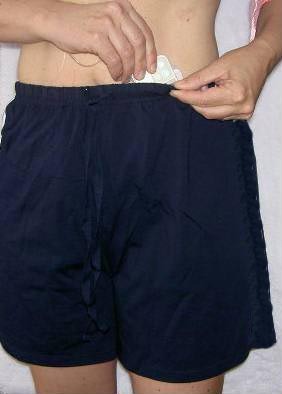 Picture shows pump being inserted into pump pocket. PARENTS: if your child is new on the pump and having trouble finding a comfortable place to wear it, try the flannel boxers or Pumpnshort as underwear/boxers for boys. For girls they can be worn under dresses. It keeps the pump safe under their clothing. No exposed tubing and no fumbling with the pump. It's a great idea, you might want to give it a try. Call Tamara at 800-831-8929 for more details.